Blenheim Palace Natural Mineral Water is drawn from an aquifer deep beneath the beautiful grounds of Blenheim Palace, home to the 11th Duke of Marlborough and the birthplace of Sir Winston Churchill. The water is sourced, bottled and delivered directly to your door. 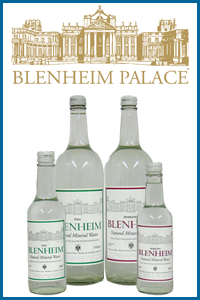 Blenheim Palace Natural Mineral Water is available in two sizes, the 18.9 Litre and 13.0 Litre bottle. Price reductions are given for high volume orders. We also supply Glass bottles for use in meetings and functions, these are available in Still and Sparkling, by the case in 75cl and 33cl bottles. To monitor the stability, quality and mineral content of the water, an external Laboratory carry's out regular tests in line with the legislation set out within The Natural Mineral Water, Spring Water and Bottled Drinking Water Regulations. Natural Mineral Water must come from an identified and protected source. It is guaranteed to be consistent in composition and naturally wholesome without any treatment - except in some cases the addition of carbon dioxide to make the water sparkle. Natural Mineral Water status is only granted to waters that are demonstrated to be free from pollution and have a characteristic stable composition..